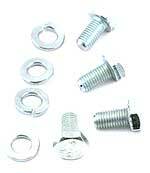 Oil pipe mount kit 1928-31. Two bolts with special copper washers for mounting the oil return pipe. Made in USA. A complete new pump for the model A and model B Ford 4 cylinder engine! Drive gear housing 1928-31. This is the housing that the A-6551 oil pump drive gear spins in. Mounts in valve chamber. Made in USA. Oil pump drive gear for the 1928-34 four cylinder engine. 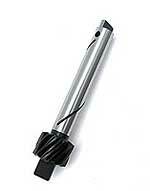 Check this gear for wear when you overhaul your engine. It performs a very important job, and takes a heck of a beating! Excellent quality! Complete oil pump drive gear assembly for the Model A Ford engine. 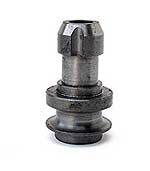 Drive gear sleeve pin 1928-31. This is the small pin that holds the oil pump drive gear sleeve onto the oil pump drive gear. Made in USA. Drive gear sleeve 1928-31. The sleeve that is pinned onto the oil pump drive gear to hold it into the drive gear housing. Made in USA. 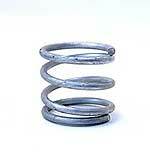 Drive gear spring 1928-31. The long spring that holds the oil pump drive gear assembly in place in the valve chamber. Made in USA. Oil pump parts kit 1928-31. All parts needed to rebuild your pump. 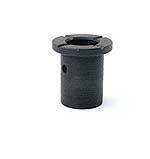 If you have the early style pump with a bore of 0.654, you'll have to purchase A-6612-AR bushings also. Made in USA. 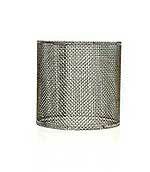 New zinc plated oil pump screen cover for the 1928-31 Model A engine. These are the earlier oil pump bushings which had a little larger O.D. of around 0.654. Note: The later style is the most common. check first. Set of 2. Made in USA. 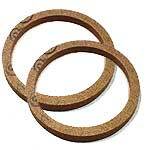 Oil pump bushing set for the oil pump. This is the later style which is the most common. Set of 2. Made in USA. Note: The earlier bushings had a little larger O.D. of around 0.654 so please check this first. A low pressure gauge set for the Model A Ford. Measures 0-10 pounds. Unit comes with everything needed for installation. 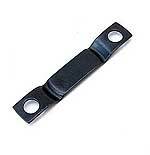 Fits any standard 2-1/16" gauge holder bracket. This zero to ten gauge is made by Stewart Warner. The black face plate has white lettering which includes 'OIL', 'REX-A-CO' AND 'USA'. Chrome rim. 2" diameter gauge. To install, remove oil pump block screw from side of block below distributor and install oil line to pick up pressure. Includes oil line and bulb with gauge. Set of tubing and fittings needed to hook up your own oil pressure gauge to your Model A Ford. We offer a range of oil guage mounting brackets for your Model A. The flat steel plate that bolts to the bottom of the oil pump. Made in USA. Oil pump Bottom plate bolts 1928-31. The 4 short fine threaded bolts and lock washers that hold onto the oil pump. Made in USA. Oil pump Spring retainer 1928-31. 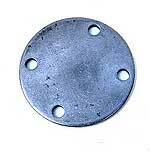 Flat steel retainer that holds the A-6620 spring to the oil pump. Made in USA. Oil pump Gear cover gasket for the Model A and B engine. Goes between oil pump housing and cover plate on bottom of pump. Made in USA. Oil pump Retainer spring 1928-34. 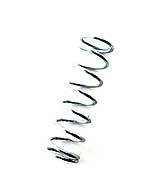 The retainer spring that fits on the bottom of the oil pump. This slotted pipe plug also goes on the side of the block near the bottom where the oil pump slips up in. Oil pump retainer for the model A engine. This is a great tool, to hold the oil pump in the block when you drop the sump. This is the screen that goes in the oil pump. Comes formed with the edges soldered. Made in USA. 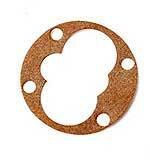 Oil pump screen cover gasket for the oil pump screen cover.